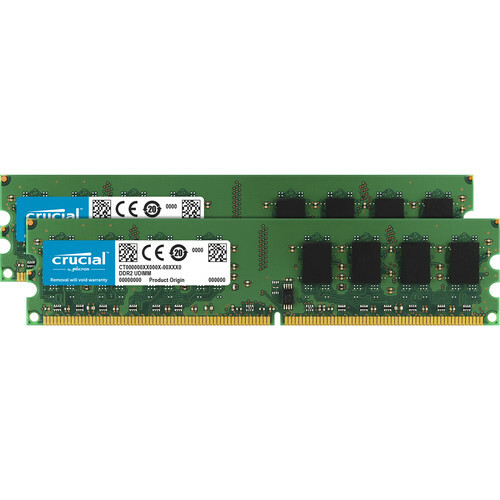 The 2GB (2x1GB) DIMM Desktop Memory Upgrade Kit from Crucial Technology can help to greatly increase the speed of your desktop computer. Increasing your computer's RAM enables more applications to run simultaneously without system glitches. You can breathe new life into your old computer by upgrading its memory. 2GB (2x1GB) DIMM Desktop Memory Upgrade Kit is rated 4.9 out of 5 by 14. Rated 5 out of 5 by jd from Excellent Upgrade! I sacrificed (removed) the 512mb module in slot one in order to max. the A7V8X-X board out at 2 gigs. of PC2700. When running dual sided modules this board only lets you fill 2 of the 3 DIMM sockets. 2X1GB modules are the maximum I could have. This is a great upgrade for an older computer. I've run almost 10 complete passes (21+hours) of Memtest86 v4.10 with no errors. This memory and an AGP card upgrade have prolonged the life of this computer. I highly recommend. Rated 5 out of 5 by imjazzi from Easy to install I upgraded two Dell computers. They now run like new. Took only about 15 mins per machine, and that included dusting the inside of the machine. Rated 5 out of 5 by rtbirdy from Works great as advertized I followed your suggestions and it solved my preformance problems. Rated 5 out of 5 by jewilson1958 from Easy Install and Speed to Boot I work 10 to 17 hours a day on my cmputter for business. Access to different programs quickly is a must for me. I needed additional memory for my computer to run smoothly and reduce the freezing between and during program changing. I went from 1GB to 4GB, install it myself and have not looked backed. Problems have been solved automatically. No fuss or confusing installation. I would certainly recommend this upgrade kit to anyone. Rated 5 out of 5 by Anonymous from Solid I went from one stick running 1GB single-channel at CL5 to this 2x1GB kit, and even though it's CL6, the benefit of running dual-channel made for higher score on the benchmark. More importantly, the upgrade from 1GB to 2GB is very noticeable and seems just about the perfect amount for everyday XP computing.Definitely worth the $, best price I could find right now. Thanks B&H! Rated 5 out of 5 by Bascule from Exactly what it says I went from 2GB 533 MHz memory to 4GB 800 MHz and do notice performance improvements with multiple open applications, especially when switching between browser windows. Of course, I do not know whether it was the 800 MHz or the extra 2GB's that are responsible but there is a definite improvement. Rated 5 out of 5 by A.S.P.C. Consulting, inc. from Would highly recomend Have used this brand before with never an issue. I installed it about a week ago now on my Intel P4 3.2 ghz board as a mathched set to run as dual channel, runnig great so far with no problems. I am an avid PC gamer but do not intend on over clocking it. Great value with a great price.